At Après Furniture we supply high quality modern wall clocks and desk clocks for the office and home environment. 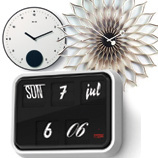 Our range of George Nelson designer wall clocks is complemented by our desk clock selection. 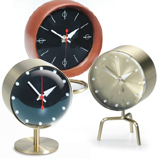 George Nelson clock designs are timeless. Whether you are looking for vintage wall clocks, contemporary wall clocks or office desk clocks with colour and style, Après Furniture is the place to find the latest wall clock and unique desk clock designs. Wall clocks are of course designed to tell the time but we think they ought to provide aesthetic delight every day as well. All of our wall clocks are a statement piece as well as offering their perfunctory timekeeping role. Take, for example, the famous Vitra Ball Wall Clock. A beautiful timepiece, Ball Wall Clock is constructed with lacquered wood and metal, with a high-grade quartz clockwork mechanism powered by a battery. Twelve “balls” are placed equidistantly making for an impressive piece of wall art and not just a method of telling the time. Various colours are available to perfectly complement – or contrast with – your existing interior design. From the same designer, Sunburst clock offers a wonderfully simple measurement of time and can be used as an office wall clock or at home, whether in the study, bedroom or as a kitchen wall clock. Similarly, our range of unique desk clocks offer something different to their digital counterparts. Designed by George Nelson in the mid-twentieth century, the Tripod Desk Clock, Night Desk Clock and Cone Desk Clock each provide a retrospective addition to the modern office desk. Whichever timepiece you decide upon, for home or office, you can be sure that George Nelson designer clocks from Après Furniture are authentic Vitra clock designs.